The Winter-Spring 2016 issue is upon us at last. Hey, we still have a few days until the equinox, right? Or, as one reader recently joked: “Winter in the Northwest lasts until June,” so we can stand by our timing with pride. And we are especially proud of this issue. Volume 10.2 of the New Series, it marks the completion of a vibrant decade of weaving together poetry, civic culture, and the visual arts. We have taken great joy in exploring our roots as a Northwest trading post while reinventing ourselves for the global digital age. 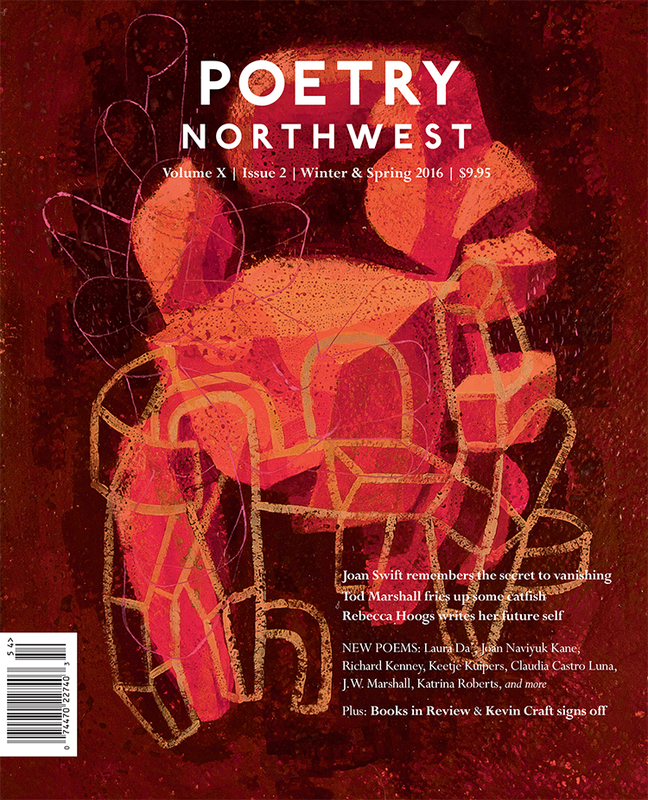 This issue concentrates our best efforts over the last ten years to ensure that Poetry Northwest remains a vital part of print culture in this region and everywhere that poets roam. We’re pleased to feature new poems from Joan Swift, who first contributed to the magazine in 1959, and Tod Marshall, our newly minted Washington state Poet Laureate. In between, you’ll find exceptional new work from a wide range of thoughtful, big-hearted, energetic poets, including Laura Da’, Rebecca Hoogs, Joan Naviyuk Kane, Keetje Kuipers, Richard Kenney, Claudia Castro Luna, J.W. Marshall, Katrina Roberts, Rich Smith, Nance van Winckel, and so many more. In visual arts, the issue features interwoven series from several Northwest heroes: David Hytone, who supplied the gorgeous cover, as well as Emily Gherard, who works shadowy wonders with graphite, and Kelly Froh, whose comic genius is unparalleled. This issue marks the 50th anniversary of Carolyn Kizer‘s departure from the masthead to take up her position as the first Director of Literature Programs at a brand new NEA. It also marks the closing season for current editor Kevin Craft. The poems in this issue and those already selected for the next (Summer & Fall 2016) represent his final curatorial effort for the magazine. In his Base Camp column, he explains that when he took on the editorship, he also “set a term limit” for himself, believing that “a magazine should evolve, and revolve, to reflect its community.” A new editorial team is in place, and will begin in earnest in June, led by co-Editors Aaron Barrell and Erin Malone, and Managing Editor Rebecca Brinson. Inspired by the original editorial camaraderie of Kizer, Hugo, and Bentley, this new team promises to showcase the diversity of Northwest letters for years to come. Meanwhile, Kevin Craft moves into a new role as Executive Editor of Poetry NW Editions. That’s right: this year, Poetry NW will begin publishing its own books in the Cascade Poetry Series. Our first selection has already been made: Kizer Prize winner Sierra Nelson will publish her second collection, The Lachrymose Report, in spring 2017. We’re excited about this evolution in our mission to support Northwest poets and the slow cure values of print culture. We look forward to hearing from you as we grow.